Successfully Added T-Bao X8S Windows Notebook - Apollo Lake CPU, 6GB RAM, 15.6 Inch FHD Display, Windows 10, 64GB eMMC, Wi-Fi, Mini HDMI, 8000mAh to your Shopping Cart. Windows 10 laptop PC comes with an attractive design and even better price. Apollo Lake CPU, 6GB of RAM and 64GB eMMC storage is ideal for multitasking. 15.6 Inch display with full HD resolutions makes movies, surfing the web, and games a delight. 8000mAh battery for 4 hours of video. The T-Bao X8S Notebook is a 15.6-inch notebook that comes equipped with an Intel Celeron N3450 Quad Core CPU and 6GB of RAM. It is one of the few Apollo Lake powered laptops to feature a larger screen and with its full HD 1920x1080 resolutions you can enjoy crisp images and a rich color gamut. 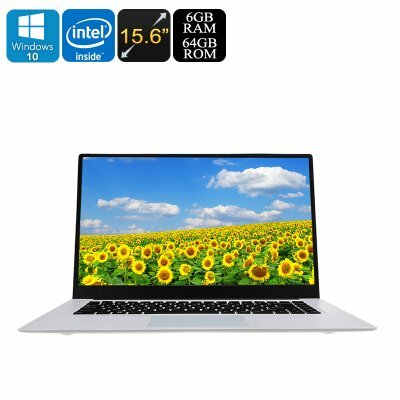 This makes it a good option for those who are looking for a large screen notebook but don't have a big budget. The body of this laptop computer is made from a tough plastic with a nice textured surface. Its tapered from back to front and has 4 large rubber feet to stop it slipping on glossy surfaces. At 1.6kg the T-Bao X8S is a good weight considering its large display. On opening the laptop you're greeted by a bright display that has surprisingly thin bezels and respectable brightness. Kitted out with micro SD card slot, Mini HDMI port as well as USB3.0, 2.0 and 3.5mm audio interface the T-Bao lets you hook up a number of other devices and offers plenty of options to expand its 64GB of onboard storage. Windows 10 Home version comes as standard on the laptop and with the 6GB of RAM, it performs well for multitasking. An 8000mAh battery delivers around 4 hours of video playback time so you can watch a film, surf the web and even get some work done all from a single charge. The T-Bao X8S Windows 10 notebook comes with 12 months warranty, brought to you by the leader in electronic devices as well as wholesale Windows tablets and laptops..